RUN VT: This time last year the University of Portsmouth course team and students of BSc Television and Broadcasting were recovering from a mammoth charity fundraising 24 hour broadcast. In hindsight this event helped to convey what the course was capable of, and it created an unforgettable milestone moment. Every year the Portsmouth Creative and Cultural Industries Faculty (CCI) stage a huge Final Year Graduate Show, and TV & Broadcasting use this event as an opportunity to build a notable broadcast around it. Perhaps understandably the students following in their predecessors footsteps were very nervous at the challenges that lay ahead, and planning began early in 2015 to review and choose the best ideas to throw weight behind. Eventually it was decided to stage a multi-location outside broadcast on May 29th, beginning at 12 Noon, and finishing at 8pm the same day. The mission was simple - transmit via satellite (for the first time ever!) a live TV signal from HMS Warrior in Portsmouths Historic Dockyard, back to the main faculty Eldon building where two separate simultaneous OBs were already taking place what could possibly go wrong? Whilst our mission seemed simple on paper, which it would be for a broadcasting organisation, for a higher education institution, it wasnt simple at all! So what could wrong? Well, our stress levels were a little low, so we decided to heavily advertise our first actual live MiniCaster satellite broadcast as far and wide as possible! It would either work, or a lot of people would know that wed fallen on our faces quite early on. Previous final year shows, the students were assessed on the output, and it guaranteed students would show up on the day and put in their best effort. But we changed that for this year and made it non-assessed and come along if youre interested; let the worrying begin! Add into the pot that the event would rely quite heavily on good weather, otherwise we would truly be looking at a washout. As it was, we had nothing to worry about, and all eight hours provided the experience we hoped for. A healthy range of students from all year groups (never before had first year students been involved) committed to the event, turned up and gave it their best shot - indeed they even seemed to love every minute! Staff members provided the planning and basic foundation of the production and facilitated each OB, whilst the students made it happen. 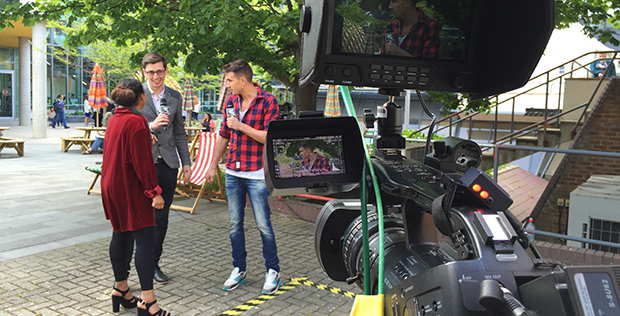 This is what they all had to say about our eight hour multi-location and multi-camera outside broadcast. Louise Lovesey, CCI Support Staff, The end of year show for us is usually an opportunity to really challenge both ourselves and the students with the kit we own. The focus of this years show was Outside Broadcasting, and unlike our previous shows, we completely moved out of the main studio and only used the gallery to monitor the TX output and feed between the many different live inputs. 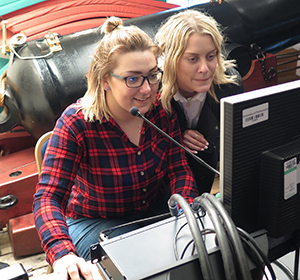 With feeds coming in from the CCI Hub studio, the Gearhouse OB lite and the miniCASTER HMS Warrior, it was imperative that the immense efforts being made were being successfully transmitted through the TriCaster in the studio at the right time. The role I took on was very important and due to the number of locations and specific timings we needed, someone had to be in charge of the command center orchestrating it all. It doesnt matter how much effort you put into a broadcast, if the signal isnt going where it should, a massive error has been made. Thankfully, all went as it should. Alex Sermon, director/producer TVB 3rd Year, "The best part for me was how we coped on the fly. We were making decisions quickly not through haste but because we had to. We were laying out the road in front of us as we were moving 100 mph...anyone else would crumble but because we've been taught well and we've experienced these situations we came out the other side with an amazing 5 hour broadcast behind us." Gemma Frith, presenter 2nd Year, "The final year broadcast was so much fun! For me, it was a fantastic opportunity to build my confidence and improve my skills in interviewing as we held countless interviews across the afternoon. Prior to this event, I had only ever held one interview and I was very nervous, but now I'm happy and confident that I will be able to interview guests again without a problem, all thanks to the final year broadcast." Alex Watson, sound/camera operator 1st Year, "The day spent in the Eldon Broadcast Hub is one that I won't forget anytime soon...Working together with second and third-year students to bring our portion of the final year show to CCI TV and the Portsmouth Big Screen really helped to make our team such a pleasure to work with - everyone had different experiences and skill-sets, and rather than just sticking to our comfort zones, everyone played to their strengths whilst also not being afraid of stepping up to the plate and doing a role which they had never done before." Alexandra Bate, production assistant 3rd Year, "I think my favourite part of the day was kind of how uncertain it was. It felt more real and we were more in control and able to change and adapt the show as we went. I felt like the whole 3 years led up to this and it was the most professional I felt whilst working on a show - I wasn't even stressed out whilst doing it, which made the day even better!" Raechelle Jackson, producer/script writer/autocue operator 3rd Year, "It was fast-paced, it was chaotic and it was the best 5 hours of broadcasting I've partaken in. For someone whose passion lies in writing, editing the script on-the-go was exhilarating but it didn't come easy as half way through I did find myself forgetting how to type coherent sentences. The most warming experience of the final year show for me was the support we offered each other. The day wasn't just about finding a way to broadcast 5 hours straight and linking elements together; it was about teaching and learning. The Eldon Broadcast Hub was alive with first, second and third years guiding each other and working together and this is what I will take away from that experience...the most important part was that it was fun. We became a united team and my favourite memory remains in the last 10 minutes when we all held wine glasses and raised a 'cheers' to our 5 hours of broadcasting and to each other... not only for pulling it all together but for being fun and creative as we did so. Congratulations #teameldonhub." Oli Ing, Big Screen and HMS Warrior Producer, Im a graduate from TVB and I was employed last year to produce and manage the Big Screen Portsmouth. My job was to schedule in the 8 hour event and then produce and oversee the Live MiniCaster transmission. Charlie Watts, the course leader had trusted me to hire the transport, get the t-shirts printed, and deliver 40 minutes of broadcast content from the Worlds first steel ship. No pressure then, cheers Charlie, it was a blast! Mike Parsons, Eldon Courtyard Outside Broadcast Producer, Gearhouse Broadcast provided unbelievable support this year in the shape of their OB Lite truck, and hands-on guidance from skilled engineers. 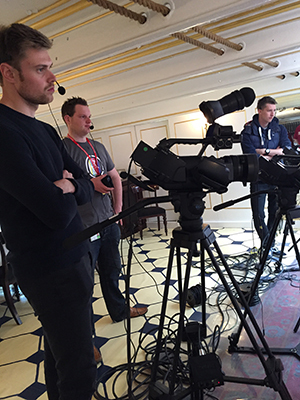 We had full-on industry kit offering fibre optic delivery of 4 x HD cameras, whilst an EVS system was dutiable being operated by a TVB student who was compiling a highlights package to be transmitted at the end of the programme. Think kid, toyshop, happy and that was me! Hannah Jary Eldon Courtyard Outside Broadcast EVS Operator, Ive never used an EVS in my life, but after a few hours of great instruction from the Gearhouse engineer I felt ready to give it ago. I love EVS now and I feel Ive just added a really serious skill to my C.V! Jake Ives Eldon Courtyard Outside Broadcast Vision Mixer/Director, When my forehead started to sweat ice cold beads of water, I knew I was pretty nervous about what was going to happen. Some early rain had slowed up the day prep, and I only had about an hour to learn the desk, and get my head around how I wanted the 4 hours of courtyard broadcast to go. I felt sick just before things started, but then I settled down and really enjoyed it!